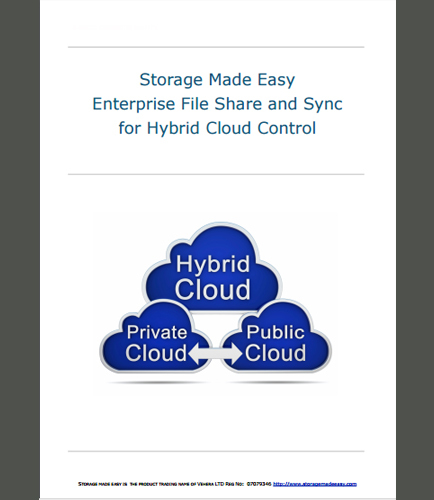 "Benefits of a hybrid cloud strategy and enterprise file synchronization"
Enterprise File Sharing and Sync solution for Hybrid Cloud Control allows IT to regain control of "cloud data sprawl" by unifying private / public company data and privately used employee cloud data solutions into a single converged infrastructure. Hybrid Cloud essentially continues to offer businesses all the benefits associated with the public cloud whilst enabling them to continue to have choices of storing certain types of data privately. What is Hybrid Cloud and what are the benefits of a hybrid cloud strategy? Enterprise file sharing and synchronization as a cloud control point for existing private data and public cloud data sets.